The Sacred Page: John 21: Later Addition or Epilogue? In a comment to the last post, Danny Zacharias rightly points out that the question of authorship of the Fourth Gospel really depends on how one views the final chapter. Is John 21--the chapter where, arguably, we learn the most about the "beloved disciple"--a later addition to the book or was it originally part of the Gospel? It is widely acknowledged that John 20 stands as an appropriate ending to the book. It presents us with, what Beasely-Murray calls, a "total picture of the Easter story": the empty tomb, the witness of Mary Magdalene, the confirmation of the empty tomb by two disciples, an appearance of Jesus to Mary and other disciples, the reception of the Spirit and Jesus' commissioning of the apostles. Moreover, the chapter ends with an epilogue, which seems to bring the book to a close: "Now Jesus did many other signs in the presence of the disciples, which are not written in this book; ﻿31﻿ but these are written that you may believe that Jesus is the Christ, the Son of God, and that believing you may have life in his name" (John 20:30-31). Beasely-Murray thus concludes: "Had he planned to record the appearance(s) to Peter and his colleagues narrated in chap. 21 he would have composed chap. 20 differently" [George R. Beasely-Murray, John (2nd ed. ; WBC 36; Columbia: Thomas Nelson, 1999), 395]. 1. The epilogue in chapter 20:30-31 serves as an apparent conclusion, as mentioned above. 2. Chapter 21 does not show us the disciples setting out on the mission given to them by Jesus in chapter 20--rather than going out to evangelize, the apostles go fishing. 3. Whereas chapter 20 called for believing without seeing, chapter 21 seems to emphasize the importance of seeing and believing. 4. There is a reference to "we" in John 21:24, which most see as an indication of later redactional work. 5. Chapter 21 seems to focus on concerns of the Church--addressing issues of the later Christian community. 6. Some of the themes developed in chapter 21 are only found in places in the Gospel where scholars believe later interpolations have been introduced. 7. Chapter 21 contains language and stylistic elements not found elsewhere in the Gospel. [These arguments are laid out by John Breck, "John 21: Appendix, Epilogue or Conclusion?, in St. Vladimir's Theological Quarterly 36 (1992): 27-49]. Here I want to look at these seven arguments. 1. Double endings seem to be characteristic of Johannine literature. Breck cites the work of Peter Ellis, who has noted the use of double-endings in Johannine literature. Consider John 12:36b-37: “When Jesus had said this, he departed and hid himself from them. ﻿37﻿ Though he had done so many signs before them, yet they did not believe in him.” Interestingly, the passage continues on to say that the disbelief of the Jews fulfilled a prophecy of Isaiah (12:38-43). It then relates a final speech of Jesus (12:44-50). This especially curious since John has already stated that Jesus went and hid himself from the people! Moreover, John 20:35ff. and 21:25 seem to form a kind of inclusion. A. (20:30f). Inclusion: Many signs. A.’ (21:25) Conclusion: the overwhelming number of signs of Jesus. C. (19:20b) and it was written in Hebrew, Latin and in Greek. 2. If one takes seriously the Lukan account of Pentecost then one of course would not yet expect the apostles to go out yet to evangelize. Yet, the mission given to the disciples in the previous chapter is probably not completely forgotten, since the catching of fish certainly seems an appropriate metaphor for their future ministry. 3. In chapter 21, it is only the Beloved Disciple who recognizes Jesus and only after Jesus’ voice was heard and obeyed. I would agree with Blomberg, who argues that objections (3) and (5) are “proabaly false disjunctions. We should also note here verse 23: “The saying spread abroad among the brethren that this disciple was not to die; yet Jesus did not say to him that he was not to die, but, ‘If it is my will that he remain until I come, what is that to you?’” While some have seen this as an addition made after the death of the Beloved Disciple, nothing in the text necessarily leads to that conclusion. 5. While it is true that the end of chapter 21 focuses on ecclesiological issues, one need be careful not to overstate this dimension of the chapter. The first part is clearly focused on a resurrection appearance of Christ―with many similarities to chapter 20, it should be noted. It should also be mentioned that concern for the community of faith is not at all foreign to the Gospel. One need only think of the Farewell Discourse in chapters 13-16 (the promise of the sending of the Spirit upon the disciples; the warning of future persectutions; the vine and branch imagery used for Christ and believers; Jesus’ insistence that the disciples have been “chosen”; the notion of disciples “bearing fruit”). 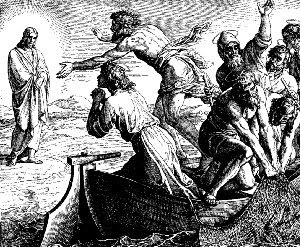 In fact, the failed fishing expedition seems to corroborate Jesus’ warning in chapter 15:5: “apart from me, you can do nothing.” The final prayer of Christ in chapter 17 is also clearly concerned with the fate of the Christian community. 6. The supposed interpolations linked to John 21 are actually probably authentic. These interpolations are 6:51c-58 and 5:28-29. A close examination reveals their connection to chiastic structures within the text. 7. In regard to the language differences, much is due to the unique content of chapter 21. In addition, see the work of de Solages and Vacherot who have offered a detailed examination, showing that this chapter is not on the whole significantly more different than other sections within the Gospel, which contain unique elements. I must admit that I have not read everything out there on this issue. I have to do a lot more work before I can insist that John 21 is clearly authentic. However, very few of those who dismiss the authenticity of chapter 21 seriously engage with the arguments above. That concerns me a great deal. My conclusion--at this point--would be that given what we have seen above, I think it is difficult to simply shrug off the authenticity the chapter. In fact, a strong case can be made in favor of seeing it as part of the literary whole of the Gospel. Merely appealing to the "majority opinion" among scholars will not do. We might also add one observation that we have not mentioned: there is no manuscript evidence to indicate that either the title of the Gospel or last chapter were ever added later to the document. Such conclusions are not based on what is found in ancient manuscripts but rather on certain hypothetical conclusions. Furthermore, I should add that it seems to me that the presence of the prologue at the start of the Gospel makes it likely that the Gospel would conclude with a kind of epilogue. Of course, that in-and-of-itself does not constitute a very strong argument. However, in my opinion, taken with what we've seen above such a view garners some force. Peter Ellis, “The Authenticity of John 21,” in St. Vladimir’s Theological Quarterly 36 (1992): 17-25; idem., The Genius of John: A Composition-Critical Commentary on the Fourth Gospel (Collegeville: Liturgical Press, 1984), 290-312. For a fuller treatment see Peter Ellis, “Inclusion, Chiasm and the Division of the Fourth Gospel,” in St. Vladimir’s Theological Quarterly 47 (2003): 131-154. Peter Ellis, “The Authenticity of John 21,” 24. Craig Blomberg, The Historical Reliability of John’s Gospel (Downers Grove: InterVarsity Press, 2001), 272. For a detailed look, see Breck, “John 21,” 35; Ellis, The Genius of John, 90ff. Bruno de Solages and J. –M. Vacherot, “Le chapitre XXI de Jean: est-il de la meme plume que le reste de l’Evangile?" in Bulletin de littérature ecclésiastique 80: 96-101. I found Ellis' "The Genius of John", along with Jerome Walsh's "The Style and Structure of Biblical Hebrew Narrative" to be very interesting. Perhaps it's time to put Johnnine Bultmannia to bed. Thanks for that Michael, could to hear your perspective. Bauckham also believes that Chapter 21 was not a later addition. He views it as part of a two stage Epilogue that mirrors the Gospel's Prologue. If I understand it right, all extant mss. of John have Ch. 21. This would seem to present a problem for the concept of a "later addition." Confronted with this fact, some commentators posit that John added Ch. 21 himself! Others, however, complain that if he had he would have deleted 20:30 and 31. But let's take that argument a step further. If some alleged forger had physical and temporal access to John's original mss. such that he could tack on another chapter before any copies could be made, and if he wanted readers to believe that he was the author of the previous twenty chapters (for so he writes), then why didn't HE delete 20:30 and 31? Was he smart enough to write Ch. 21 but too stupid to cover his tracks? Also, would it not be the height of hubris and hypocrisy for some forger to make the bold claim of 21:24 to be a disciple and true witness, all along knowing he was lying in his teeth? Honestly now, before the theologians got hold of you, how many years did you read the Gospel of John without the faintest thought that it was supposed to end at Ch. 20? As in many cases it seems, liberalism is a state of mind people bring to the text; it is not demanded by the evidence. While I think you've done some good research here, there are undoubtedly issues with the chapter. For example Bullfighter, your allegation that a forger would have had to tack on Chapter 21 as an addition to the Original MSS is unnecessary. For the earliest extant manuscript of John we have is dated from the third century A.D. (200s) and is incomplete and so does not even include John 20 or 21, whereas the earliest full manuscripts we have (which differ from each other) are from the 4th century A.D. (300s), after the Catholic church hierarchy had been formed, opening up many possibilities for additions and interpolations in order to justify their actions. And we know that Celsus, the second century Epicurean philosopher, who alleged that: "Certain Christians, like men who are overcome by the fumes of wine and care not in the least what they say, alter the original text of the Gospels so that they admit of various and almost indefinite readings. And this, I suppose, they have done out of worldly policy, so that when we press an argument home, they might have the more scope for their pitiful evasions". To which allegation the third century Church Father Origen replied: "Besides, it is not at all fair to bring this charge against the Christian religion as a crime unworthy of its pretended purity; only those persons who were concerned in the fraud should, in equity, be held answerable for it" (Origen, Contra Celsus). Regardless, however, my issue with John 21 and why I am willing to doubt its authenticity is because in v. 16, Jesus is supposed to have said "Simon Peter poimaine my sheep" which means "shepherd", although translated as "feed". But this statement would contradict Jesus' earlier statement in John 10:16, "So there shall be one flock, one shepherd." If there is only to be one shepherd, how can he call Simon to shepherd?